Today T-Mobile announced a new unlimited plan - the 'Essentials' plan - offering a few less features than their previous plans - at a reduced price. But of high interest to mobile consumers, T-Mobile has announced they are doubling the hotspot threshold on their Unlimited ONE+ Plans from 10GB to 20GB, with a price increase for single line accounts. Both Essentials, and the new 20GB of hotspot data on ONE+ plans feature will begin on August 10th. Juxtaposing what we've seen the cellular industry do with their plans in the past few months, T-Mobile has announced that they will begin offering a stripped down unlimited plan beginning on August 10th. T-Mobile has made it clear that they have no plans to raise prices on any of their unlimited plans - and their move to offer an even cheaper plan version backs their statements up. The T-Mobile Essentials plan is designed for those who are looking for a more basic plan than T-Mobile's ONE plan line-up. The Essentials plan focues on unlimited talk, text and smartphone data - and cuts out many of the 'perks' of ONE plans - like high-speed international data, a free Netflix subscription, HD video, and hotspot data. 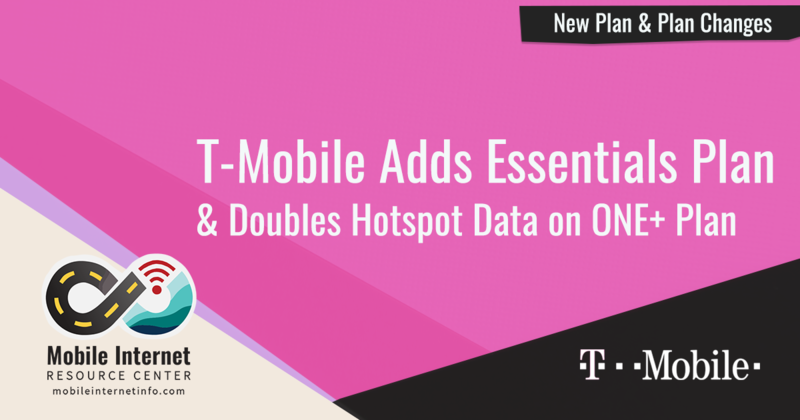 However, unlike all other T-Mobile plans, the new Essentials plan does NOT include taxes and fees - which can quickly eat into the savings. Unlimited on device high-speed data in U.S. Unlimited hotspot data with speeds always capped to 3G speeds (512kbps), with option to add on 10GB of 4G hotspot for $10/month. Unlimited talk, text, and 2G data in Mexico and Canada, plus unlimited texting and low flat rate calling at $0.25/minute in 210+ countries and destinations. 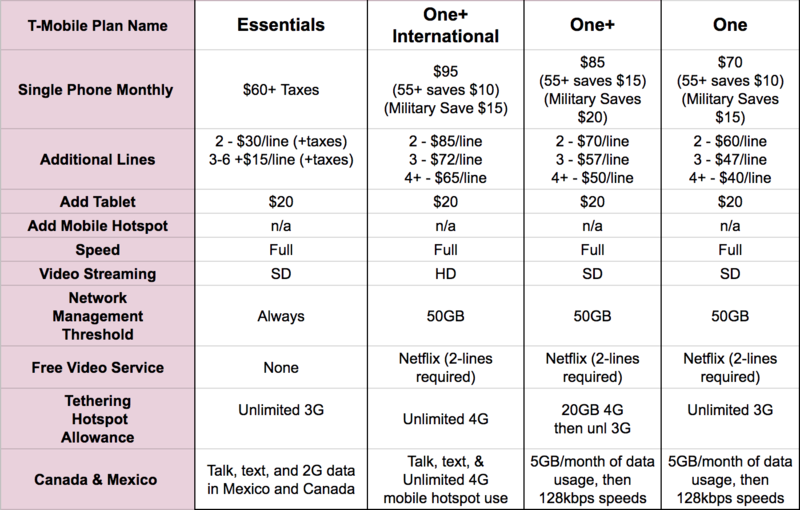 Comparison of current T-Mobile Unlimited plans. Note: ONE plans include taxes/fees in their pricing, Essentials plan does not include taxes/fees. In addition to the announcement of the new Essentials plan, T-Mobile is unceremoniously raising the high-speed hotspot data limit on their ONE+ plan to 20GB (previously 10GB). However, for single line accounts the price is going up from $10/month to $15/month. Multiple line accounts will remain at $10/month per line, but only if you add the feature to all accounts on the plan - which then shifts you to a new plan called Family One+ (which can result in losing an promotions you have). Those currently on ONE+ should be grandfathered in and be able to keep their 10GB hotspot cap, regardless if they have the feature for free, $5 or the current $10 pricing. If you want the 20GB cap, you'll need to opt in under the new terms. August 7 update: What T-Mobile didn't announce in their press release, but is now confirmed by representatives is that they are also retiring their +International Plan. This is the plan that enables unlimited 4G mobile hotspot use - a desirable feature for mobile nomads. If you wanted in on this deal - the last unlimited hotspot option standing direct from a carrier - make sure you have this enabled on your account before August 10. Check our news center for the full details (this is a breaking story). T-Mobile has announced that their next 'Uncarrier Announcement' will take place on August 15th. 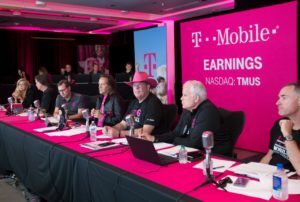 Last time T-Mobile announced high earnings, we saw Verizon go a little crazy and announce big changes of their own - including a re-invented unlimited plan (as well as a new definition of 'unlimited'). We'll be watching closely to see what T-Mobile has in store - and how the other carriers respond. Lover of long distance running, balloons, & candy. Full-time RVer exploring the U.S. indefinitely. A teaching assistant and contributor at Mobile Internet Resource Center as well as a big rig driver & dump station specialist.